This is why I love the internet. The Hound Blog is giving away Hasil Adkins – The Great Lost Album. 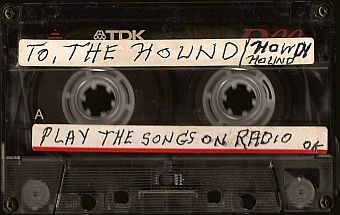 The songs are from a 90-minute cassette that the rockabilly legend had given to WFMU deejay James “The Hound” Marshall via Norton Records’ honcho Billy Miller back in the mid-90s to play on his radio show. So Billy gives me this cassette of Hasil’s home recordings, no info, no song titles, nuthin’, but every song is great. Some of his best work. Much better than anything on the Fat Possum LP (which captures Hasil on a very uninspired day). As far as I can tell none of this stuff has ever been released, so now it will escape, I being the one to unlock the cage and let it loose on you–the rest of the world. If you’re a Hasil fan, fidelity isn’t one of your great concerns, this stuff was recorded at Haze’s house in the holler somewhere in the country side outside of Madison, West Virginia and transferred to cassette by Hasil himself. If you’re unfamiliar with the Haze, the best place to start is Out To Hunch, a seminal collection of his recordings from the 50s and 60s. One of my first forays onto the world wide web was a Hasil Adkins fan site that I haven’t updated since about 1997. Fans will certainly appreciate some of the song titles on this new tape: Let Me Talk To You (Moo Moo Moo), Me & Jesus (Got It All Worked Out), Lee-Anne (I Wanna See You Boogie Woogie), Somebody I Used To Know (and Chased Away With A Baseball Bat), You’re Too Young For Me. Hasil Adkins: web, myspace, wiki. Previous PostLovetones – JourneymanNext PostPete to Carl: Let’s Be Friends!